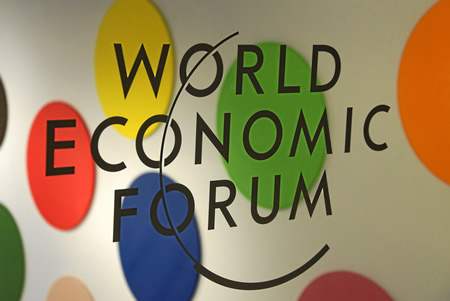 Photo: The Logo of the World Economic Forum is seen at the congress centre at the Annual Meeting 2013 in Davos, Switzerland, January 22, 2013. (Photo © Remy Steinegger/World Economic Forum). 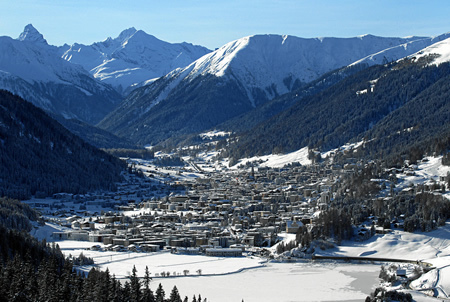 Photo: Aerial view of the alpine city Davos, Switzerland, where the World Economic Forum Annual Meeting 2013 is taking place January 23 - 27, 2013. (Photo © Andy Mettler/World Economic Forum). 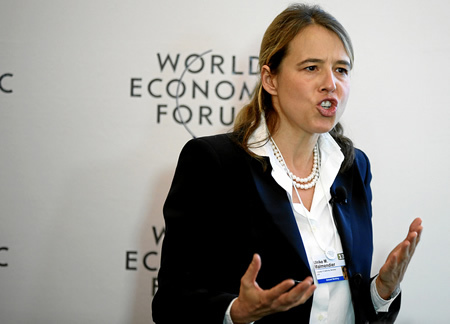 Photo: Ulrike M. Malmendier, Professor of Economics, Department of Economics, and Professor of Finance, Haas School of Business, University of California, Berkeley, USA, gives a speech during the session ‘From Tribalism to Globalism: The Evolution of Human Cooperation’ at the Annual Meeting 2013 of the World Economic Forum in Davos, Switzerland, January 25, 2013. (Photo © Mirko Ries/World Economic Forum). Speaking at the Annual Meeting, Shimon Peres, President of Israel, said the world is becoming ungovernable. “Governments have found themselves unemployed because the economy has become global while governments remain national,” he said. Peres described his view that global companies are replacing the role of governments. “Forty global companies have more fortune than all the governments in the world,” he pointed out. The co-chairs of Annual Meeting 2013 are: Frederico Curado, President and Chief Executive Officer, EMBRAER, Brazil; Muhtar A. Kent, Chairman of the Board and Chief Executive Officer, The Coca-Cola Company, USA; Huguette Labelle, Chair, Transparency International, Germany; Global Agenda Council on Responsible Mineral Resources Management; Andrew N. Liveris, Chairman and Chief Executive Officer, The Dow Chemical Company, USA; Atsutoshi Nishida, Chairman of the Board, Toshiba Corporation, Japan; and Axel A. Weber, Chairman of the Board of Directors, UBS, Switzerland.